One of the weighty issues of setting up a Typography program in the Canadian Arctic is and will forever be, equipment and supplies. Another issue is of course having someone that is skilled in its application. Another is the sea lift, the ordering of supplies so the stevedores on Montreal docks can put it all on board large ships and move everything north. Back in the day when phones were spotty everything had to be written out and mailed to both suppliers and shippers and they had to write back to confirm they had what you wanted and in fact they could get it to the docks in time. 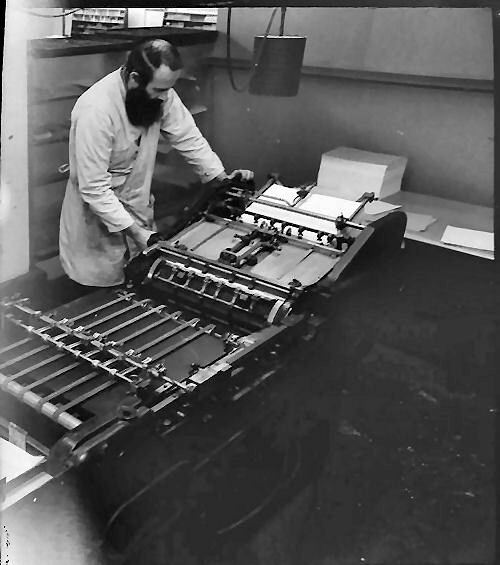 As you read in the section about Wil he arranged for the letterpress equipment to be shipped to Cape Dorset. Three presses, weighing in in tonnes not pounds, all the lead type secured in wooden crates various papers inks and other minutiae specific to the practice. Back then they were really good at moving stuff around. The equipment was vintage WW2 or Vietnam era, good enough to storm Normandy under fire should be good enough to land on an icy Cape Dorset beach. By all accounts this was the press that Wil had sent from California to Vancouver to Toronto to Cape Dorset and then back to British Columbia again. I have yet to see a photograph of either the Little Giant or the platen press in situ at Kinngait Studios when it was operational. If anyone knows of one please share. 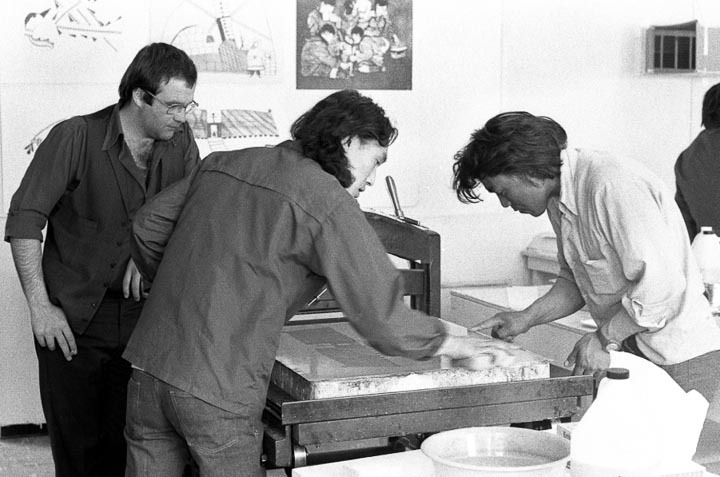 The only reference I have of anyone seeing the platen press in Cape Dorset was from Jutai Toonoo when he said that he remembered working on it and how you had to be careful not to get your hands trapped when both adding paper and then removing it. 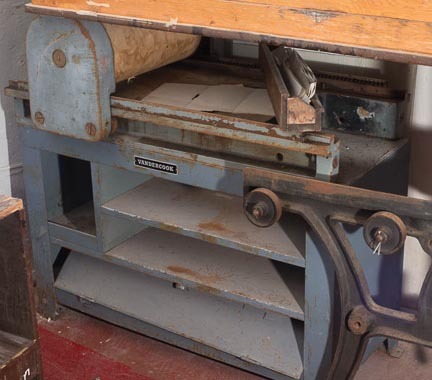 There is the matter of what Wil refers to as the 10x15 which I have to assume is a platen press, perhaps the one in this picture again from British Columbia? Wil removing the chase after printing the business cards for the photographer of these photos HH Johnston. 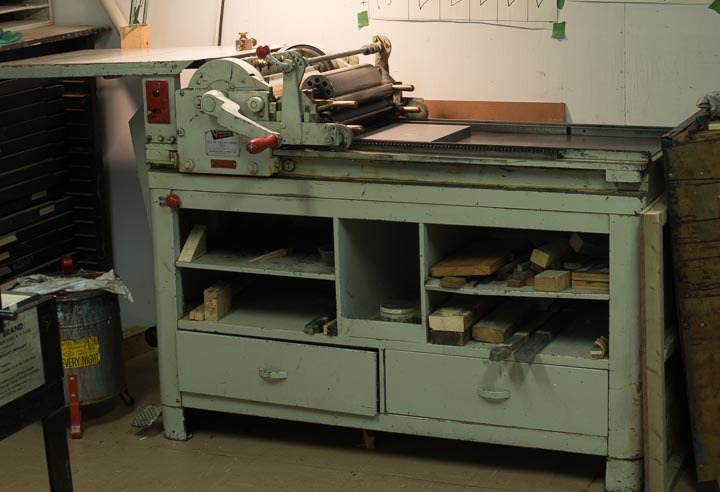 The third press that is still in Cape Dorset is the Vandercook 4T proof Press. Off to the right you can see the Vandercook 4T circa 1974. For information about the men see the blog on type. New rollers from NA Graphics, Box Car base and roller gauge absent from the inheritance stash. I remember rooting around the two matchbox buildings we keep for storage, they are from the very beginnings of the Dorset settlement story and there aren't many left. They can be moved about by front end loaders and lift trucks if need be so they are versatile. They are heated with a small oil stove and illuminated with a few bare bulbs hung at the highest point which isn't very high for a tall person. We don't keep them heated so my journey out to hunt for old stuff was brief and cold. The locks are kept lubricated so getting in was no issue. I walked over the old red linoleum snow crunching under feet, my breath fogging my glasses but I could see that my memory served me well. The Vandercook 14 was there piled high with junk, some parts were absent but I expected they were still stowed some wheres nearby. Now to get them out, that called for Ematalu and Tutuiza and the stone cart. 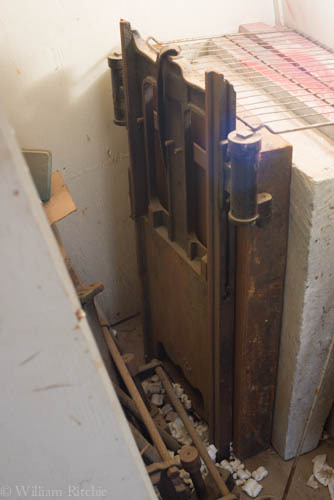 Ematalu suggested we dismantle the press to make it easier to get through the small doors and lighter to lift. Out it went and back into the studio where it was heated after 30 years of being ignored. Superficially rusted everything inside was very well greased and lubricated. Two old Fuchs and Lang lithography presses in storage as well. 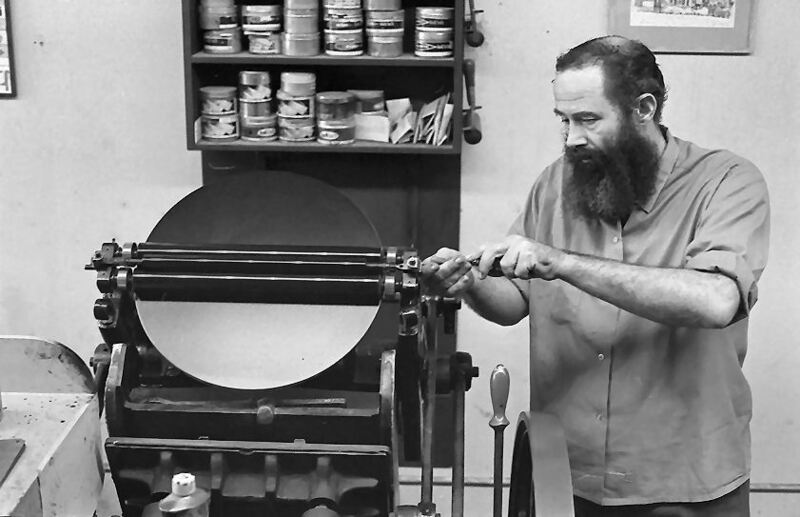 The Fuchs and Lang presses were early workhorses but quickly replaced by Charles Brand Presses. Left to right Wallace Brennan, Audla Pudlat and ? This is how the 14 came apart. Hmmm. One of the bearings that the moving assembly sits on was shattered. After a bit of research and time I found a replacement in St.John's thanks to Billy Severs. The bearings are still used today in automobile air conditioning units. as well the index gear that the upper assembly rides on was broken in half. You can see where it was brazed by the skilled torch of Mede Ryan Jr. of Witless Bay Newfoundland, thanks to Ralph Cary for sorting this out for me. The piece is cast iron so fixing it wasn't an easy thing. Ematalu Sagiak solved the problem of getting the gear back on (and off again and on again) once we figued out that the orientation of the gear(s) place the packing very specifically on the bed of the press. The 14 has two bolts that act to release and engage the paper grippers and the rotation of the cylinder has to exact. The device that spans the gap on the cylinder has a small shaft that protrudes at the middle point. This shaft has a knob on the end and that knob hits the bolt on the bed of the press right where the upper gloves pointer finger is pointing to. This acts to tip the contraption and release the paper. I replaced the packing using the template from the old material then covered it with mylar so ink can be easily wiped away. 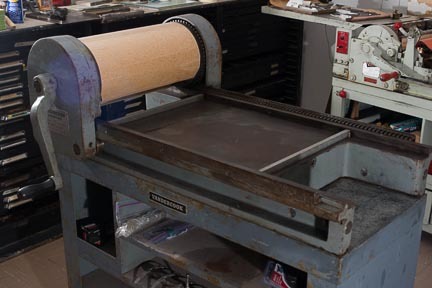 My hope is that this press will be used to print lino cuts and other relief projects. The two Vandercooks ready to roll. Here you can see Tukiki Manumee printing from the 14 press. You can also see Wil's hat on the top spoke of the etching press ships wheel. Annie Pootoogook and Tukiki Manumee have a type drawer at the #14 press. A printed proof. You can see Tukiki releasing the paper gripper so the proof can be take off the drum. This photo was taken in the now stone cut shop judging by the windows and pillars that are the same today as they were then. Left Lucta Qiatsuq and Ningutsiak Pudlat who is still alive today. The ships wheel and drum. Bed of etching press in storage, this will be the next project.